Firstly a weak trough is currently passing over the southern agricultural areas with some brief showers, but these won't amount to much. 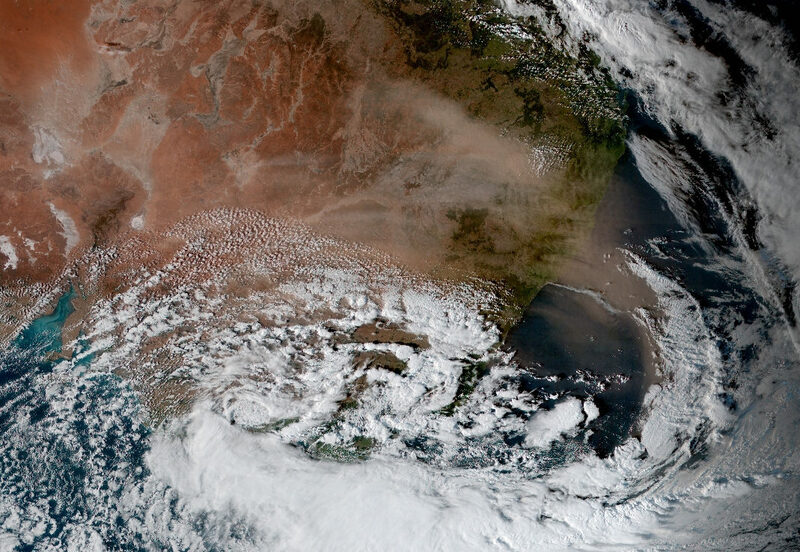 Further east an aloft a very strong jetstream is present and driving a large cloudband of tropical moisture SE wrapping into the developing low pressure area with thunderstorms over a large swath of the NT/QLD/NSW and VIC. Tomorrow morning (wednesday) a cold front on the leading edge of the deepening low will move across the agricultural areas with a band of rain, probably reaching the Adelaide area around 9am. Before this, winds will gradually freshen from the NW overnight and into the morning and could be gusty on the arrival of the rain before easing temporarily. 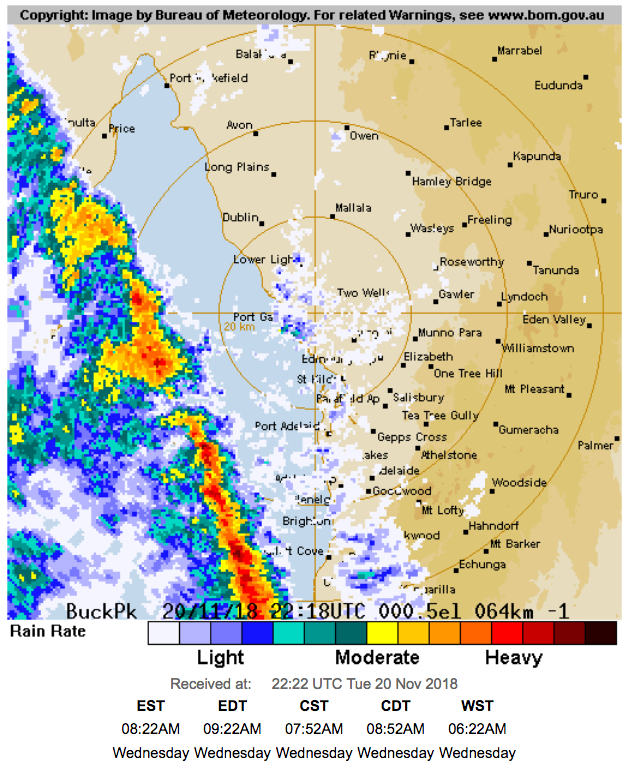 The rainband and cold front should clear eastwards after this with the back edge going through the the Adelaide area by about 1130am or so. Now initially there will be a brief clearance from the subsidence immediately behind the front but a pool of colder air aloft will de-stabilise the atmosphere from the west during the afternoon, reaching the Adelaide area from about 2pm onwards. Showers, heavy at times with isolated cold air thunderstorms (the odd rumble and bolt not frequent lightning) will then occur over a large area of the agricultural areas, especially Southern EP (reaches here from the mid morning), YP, gulf areas, hills, southern mid north and KI. There is also a fair chance of some small hail in the stronger cells as well as very strong wind gusts, especaially later in the afternoon when most unstable air comes through maximised by the strongest wind shear in the lower levels. The deepening surface low south of KI will have a strong low level jet on its western and NW flank which will wrap up and around towards the gulf areas and KI, YP into wednesday evening. The instability decreases here but moisture increases as do the winds with strong to gale force winds likely with potential for damaging gusts (see Bureau warning). Showers will become more frequent and squally and possibly tend back to rain about the Adelaide Hills with some local heavy falls likely here. The period between about 8pm and 1am will be pretty wild before things begin to ease into thursday morning. Rainfall generally 10-20mm for many southern ag areas, decreasing to 5-10mm further north and less than 5mm for far northern ag and pastoral areas and also the Riverland. Adelaide should see 15-25mm with isolated 30mm falls possible and the hills 25-50mm with isolated 60-80mm falls not beyond impossible in the known wetter spots. ills 25-50mm with isolated 60-80mm falls not beyond impossible in the known wetter spots. Tomorrow morning (wednesday) a cold front on the leading edge of the deepening low will move across the agricultural areas with a band of rain, probably reaching the Adelaide area around 9am. Spot on. The rainband struck here at Lockleys just on 930am. Huey just sent it down in the CBD. Heavier than a sunday turd after a night on the pale ale. Wonder how much if any of that wrap around will get here? Thanks Lennie for making the thread. 8.5mm so far in Clare, pretty damn heavy rainband. Adelaide right in the crosshairs for some very strong gusts this evening. Take heed, could be blackouts from falling branches and low visibility in the heavy showers so driving will be treacherous. Expecting some very solid hail showers later on today also and local thunder. 100km+ gusts possible along the coasts and over quite an extended period. The ocean will be churned right up. Managed 10mm from the cold front, leading edge was well marked by a line of convective showers typical of stronger cold fronts. 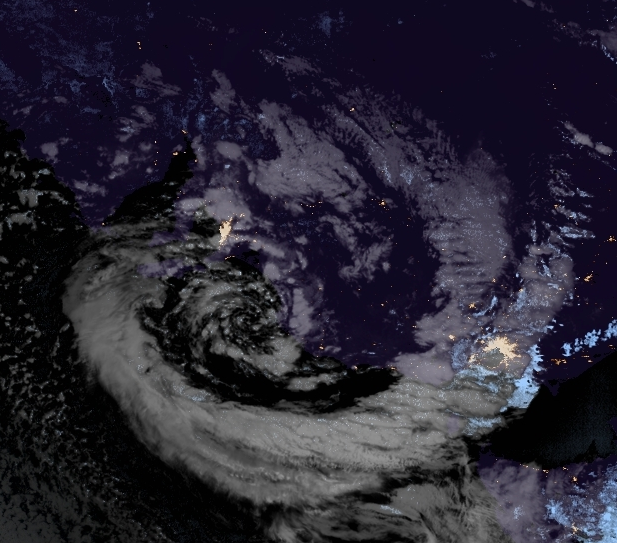 Brutal wind to follow tonight, be strong gales out on the water, possibly storm force around areas west of KI later. Plenty of 70-90s around the place. it is safe to come out yet? Casual 132km gust at Neptune Island. BoM still has the warning as 90-100km. Asleep at the wheel much, they need to upgrade it to destructive, even if it is only isolated coastlines getting destructive winds ( thus far). 2 showers. 2 horizontals. 2 with hail. Woohooo. Good hailstorm in Mount Barker with a good clap of thunder as an added bonus. Have seen 5 hail showers so far up here today, unfortunately all were short lived and mixed with rain. Seems atmosphere is too saturated for any real heavy hail showers, although that storm to the nw of here earlier looked pretty solid. Liking the look if that line in y.p. currently. Big gusts constantly hitting here. 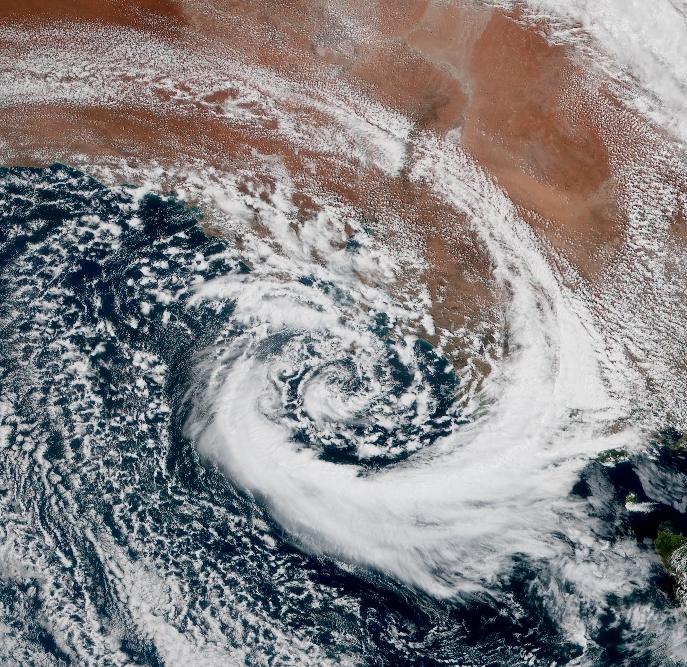 The wrap around sort of looks poised to come in on Adelaide or at least somewhere. Wow this is full on. Impressive sustained wind for 10 minutes 80kmh + combined with continuous showers. these streams are really starting to annoy me. Hail shower after hail shower, even a squally storm, all within 20km and haven't got a drop in like two hours nearly. Blegh. Upper cold will start moving on soon, I wanna see a heavy hail shower!!! Been an interesting night. Power went out here at Pooraka at about 4:30 and went back on about 9:45. Be some damage tomorrow. never mind. i looked between them taking down the old one and putting up the new one. Other gusts not mentioned in that warning. The most pronounced impact of this event though is the persistance of the winds and the strength of the sustained winds. One of the widest impacting high wind events I can remember. 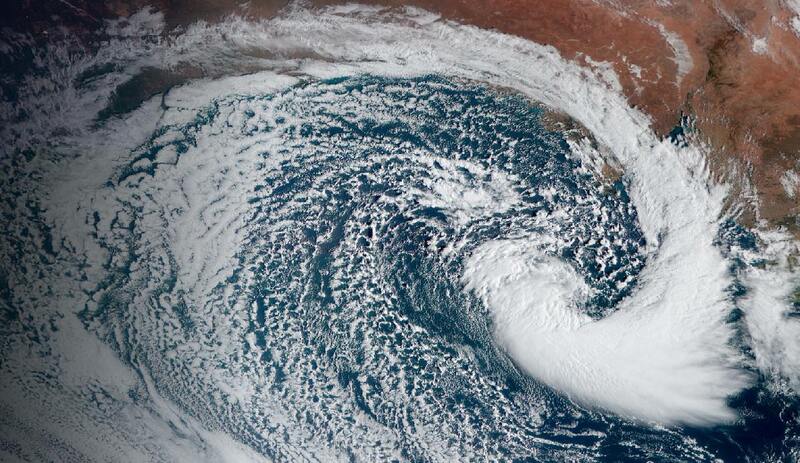 Going to be very interesting to see the damage in Adelaide come morning. Damage report at Crafers... my curbside bin blew over!! Damage at home was as far as I can see restricted to the shadecloth on the NW face of the shadehouse coming off the frame. Luckily it appears as though only the cable ties gave way so hopefully it should just be a matter of fixing the mounting clips back in place. Some broken branches along Grange Road on the way to work this morning. Recorded 11.6 mm rain since 8am yesterday morning. Went to do some planespotting last night, 4 missed approaches. Just as the Emirates 777 was about to land it appeared to touch down, then "bounce" before properly touching down. May have just been an illusion, but either way it would have been a freaky landing for the passengers on that flight. On other approaches, the aircraft were wavering about when ca 200' above the ground due to overshoot shear. 18mm in my gauge now. Loc: Near Victor Harbor S.A.
Only damage was my blueberry bush being knocked over. On the other hand, you know those plastic clamshell pool/sandpit things? Well, we got one of those from somewhere last night. No idea where it originated . Lost power again at pooraka overnight, no real damage here apart from some branches down. The power went off at 10:45pm and back on at 4pm, just as we were about to make the decision to ditch the food in the fridge. One Jacaranda tree approx 15 years old blown down from the roots but thats about it as far as the damage was concerned. 19mm in the gauge. Generated in 0.056 seconds in which 0.003 seconds were spent on a total of 13 queries. Zlib compression disabled.